Saewa and Do Jin really get on my nerves. 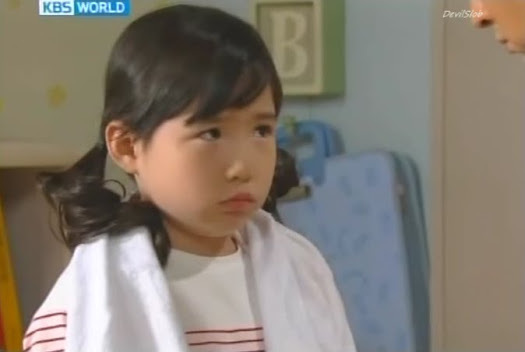 I must hand it to Park Jung Ah, she makes such good cold and vicious faces. It’s like she was born to play the bad girl role. It makes me wonder if I can ever forget the character of Saewa if she ever takes on a female lead role where she isn’t the bad girl. So, in brief, we get lots of cute Donghae-Bongi moments followed up with some not so great moments as Donghae finally discovers the truth behind Saewa’s vicious turn. Our OTP are happily celebrating Donghae’s employment and rush off to tell Anna and the rest of the Lee family the good news while Kim Joon remonstrates Saewa for speaking out of turn and volunteering herself for the host of the cooking competition. He later apologizes at home saying that he can’t show favoritism just because she is marrying his son. Saewa explains she was just openly expressing an interest and that she plans on competing fairly along with the other announcers. She also asks that she isn’t a sufferer of reverse discrimination due to being his daughter-in-law. Hye Sook seconds this and then says they will throw a small party for Kim Joon’s birthday and to announce the engagement officially. Do Jin gets made when Joon enquires after the young man’s fate in the kitchen. When he and Saewa get upstairs she asks what’s wrong and he complains about Carl Laker. This shocks Saewa. She is even more surprised when Do Jin says it looks like Carl might be dating one of the females in the food department. She of course dismisses that idea as absurd. Is it so absurd that Donghae would move on after the stunt you pulled? I think not. At dinner, the Lees celebrate Donghae’s good fortune. Anna also wants to do her part and work, but Donghae still refuses. Sun Ok asks for rent now that he has found a job, but is immediately scolded by Kang Jae as there is no way Donghae would be able to pay for anything as he needs to get things settled and arranged, plus he is only a temporary worker. Donghae then exclaims over Sun Ok’s cooking skills and later begs her for help. He’ll do any odd jobs and heavy lifting that she needs if she promises to teach him some authentic Korean cooking. Sun Ok promises to consider it and wonders how her own son is faring. Not well, of course. He is treated like dirt by both Saewa and Sool Nyeo. Tae Hoon complains about the obvious favoritism Do Jin gets and Saeyoung says the only thing he can do is become a judge or prosecutor to get her family off of his back. Tae Hoon wishes to look for normal employment first as there is no guarantee he’ll pass the exam the next go round, but Saeyoung says she only went to him as she wanted a lawyer. Ouch. This gets them into the fight of who is worse off, Tae Hoon being belittled and treated like dirt and not even able to study or Saeyoung for getting impregnated so she can’t go to school or hang with her friends, plus she has her mother and sister looking down on her more because of her husband. Donghae is studying on his own, but finds that he has no idea what the cook books are referring to as they are talking of Korean methods of cooking versus the standards he learned in America. Anna once again insists on doing her share, but Donghae also insists that she do nothing. If things work out, he’ll win the competition, get famous, and find James. Pil Jae is trying to eavesdrop, but can hear nothing. He quickly pretends to be catching a fly when Song Yi comes in. She immediately goes to the wall to hear her precious Donghae oppa’s voice. This floors Pil Jae. He tells her as a woman she must have pride and standards. Song Yi then suggests quitting her English class and having Donghae teach her instead. LMAO. So cute! But Pil Jae is having none of his little girl’s first throes of puppy love. The enthusiastic Donghae arrives early to clean and prepare, shocking the rest of the staff. He is introduced to them by Chef Bang and a comment is made about how Sunae is out the door and Donghae is hired in. Bang then asks to see Donghae’s hands. They past the cleanliness test. The staff are then told to stay on their toes as it is a busy day. Bang also announces that for the competition, the staff will have to partner up. Donghae immediately asks for Bongi and she pretends to consider it when Daesam swoops in and tries to make Donghae his partner, Bongi pushes Donghae behind her and tells Daesame that she has already claimed him. LOL. It’s so cute watching Donghae and Bongi together. Donghae is then called to meet with Hye Sook who wonders what to do about getting him a permanent visa for work since he’s in Korea on a temporary one for the sports competition. They then decide to give him a one-month trial instead of three and then go from there on whether or not to sponsor the visa. Until then, Donghae won’t be put on the official books and will be paid his wages straight out of Hye Sook’s pocket. 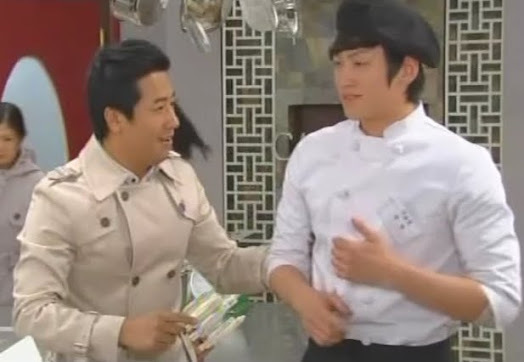 Afterward, Do Jin meets with Donghae and requests the new chef prepare him the same lunch he made Kim Joon. Donghae doesn’t wish to do so, but he does. Sool Nyeo is excited that the engagement will be officially announced and promises to do Saewa right by giving Kim Joon a great gift befitting his station. Saewa leaves and Sool Nyeo wonders if she should request her money back from Sun Ok in order to buy it. She then recalls that the man she likes is Sun Ok’s brother-in-law. What to do? She heads to the Lee house in sunglasses and shocked when she finds Anna there. She goes into the kitchen for a drink of water after the conversation goes nowhere and that’s when Pil Jae shows up. Pil Jae gives Anna a barrette. She initially refuses recalling her son’s advice, but she eventually accepts. Sool Nyeo tries to stay hiding, but Pil Jae heads to the kitchen and is shocked to find someone there. She tries to run away, but he catches her and that’s when Sun Ok arrives and the two finally learn each others identities. Sool Nyeo begs Pil Jae not to say anything about what’s happened between them and rushes off. Of course, Do Jin picks on every little thing and keeps sending Donghae to redo it over and over again. Finally Donghae says he’s had enough and that Do Jin is being childish. Do Jin wields his position over Donghae’s head, but Donghae doesn’t back down. He knows this is not constructive criticism and that Do Jin is out to get him. He leaves Do Jin’s office and promises that he won’t quit so easily. You tell, Donghae-ssi. 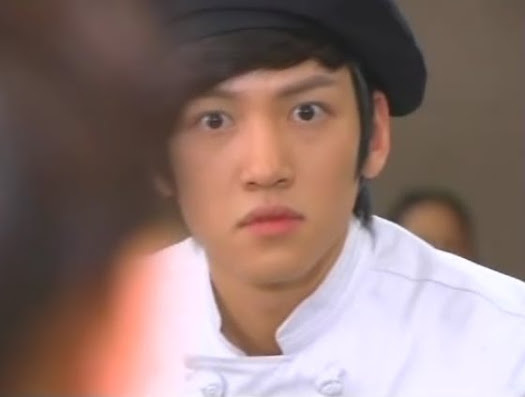 Ah, Ji Chang Wook!!!! Love him. I hope his next drama is better than BVS which had so much problem but ending up suffering from a plot identity crisis. Back in the kitchen Chef Bang informs the staff of the birthday party for Kim Joon. Daesam, Sunae, and Bongi are all put on catering duty. Bang leaves and Daesam says that he heard they are using the party to announce Do Jin’s impending marriage to some announcer. This shocks Bongi. So Saewa is really going to go through with marrying Do JIn? She then drops something on Daesam’s foot to keep him from spilling Saewa’s name and upsetting Donghae. Daesam then says the dishwasher is broken and Donghae must clean all the dirty dishes by hand by himself. And boy is there a lot. Saewa’s fellow reporters are annoyed by her good luck. It doesn’t help that she’s rubbing it in their faces (not obviously, but you know she is). Meanwhile, Bongi worries over Donghae doing the dishes all by himself and is unhappy that she has to cook for Saewa as she announces her wedding. Anna looks at Pil Jae’s gift and goes to put it in her hair, but can’t bring herself to do so. I’m not entirely sure why. Maybe she fells it would be disloyal to James if she did so? Bongi gets to the hotel the next morning and finds Donghae sleeping in the locker room. This worries her as there is no heat. Is he okay? She looks at him closely and is surprised to see his skin is much better than hers. She then determines he’d look even better if he kept his hair off his forehead (I think he looks just fine with his current haircut). While bending over him, he wakes up and they both get a huge fright. Bongi lies and just said she was worried he had a fever. Donghae replies his face was just red from lying on his arm. Heehee. So funny these two. The rest of the staff come in and are shocked to see not only the dishes, but the entire kitchen cleaned! Daesam cannot believe Donghae looks so chipper after all of that hard work. Chef Bang comes in and wonders if they lied about a broken dishwasher again. Bongi explains it’s a rite of passage. Everyone had that experience. LOL. Hye Sook calls the kitchen and requests that Donghae’s food be added to the menu for the party as Kim really likes his cooking. Saewa then arrives and only hears the last bit of the conversation. She remarks that Kim is a picky eater and Hye Sook says there is a young man she keeps running into that she recently hired in the kitchen and Kim loves his food. Do Jin then arrives and exclaims over his bride-to-be’s beauty. Hye Sook reminds Saewa to be on her best behavior as there will be influential people there. Enter Kim Joon. Daesam alerts Donghae that his food has been added to the menu. This shocks Donghae, but also makes him happy. When Bongi sees him, she asks what he is doing there. If he stays, he will find out. She asks him to meet her in the locker room as she has to tell him something. Too late. Chef Bang takes him upstairs to deliver the food and Donghae gets there just in time to learn Saewa is marrying Do Jin. You’re welcome! It’s a special pet project of mine. It’s also the reason I will forever think twice before tackling a daily drama again. So many episodes, so easy to fall behind on 😛 I hope you enjoy this drama if you decide to watch it. It’s corny and cheesy and the plot can be very predictable, but there’s just something about this drama (maybe its my beloved Ji Chang Wook-ssi) that draws me in and keeps me watching.